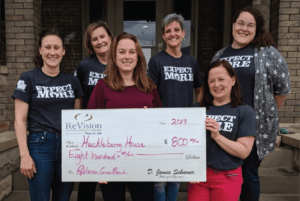 ReVision LASIK and Cataract Surgery is proud to support the life-changing work of the Huckleberry House. This non-profit works with Central Ohio’s youth and families dealing with some of life’s most difficult issues. By providing services and program to empower youth to move beyond circumstances of homelessness, poverty and abuse they instill confidence that creating a more positive future is achievable. To raise awareness about the serious issue of youth homelessness in Central Ohio, Huckleberry House organizes an annual Sleep Out event. This year, the Sleep Out was held on April 12 outside COSI. A record number of 100 participants slept outside to experience the challenges homeless teens face. To raise funds, participants are encouraged to donate individually or organize teams to request pledge donations. As of the date of the Sleep Out, Huckleberry House was quickly approaching their fundraising goal of $100,000 and with donations continuing to be accepted through June 15, meeting their goal is absolutely within reach. 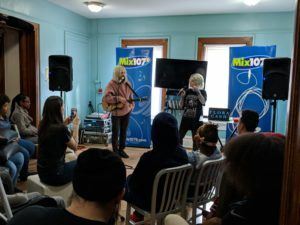 In partnership with MIX107.9 FM, a Columbus Radio Group station, ReVision Gives Back brought a special performance to the Huckleberry House featuring indie pop artists Flora Cash. Passing through Columbus to promote their new ‘Press’ album, the musical duo volunteered to perform three songs exclusively for the teens at Huckleberry House including their hit You’re Somebody Else. Following the performance, Shpresa and Cole stayed to chat with the teens, sign autographs and pose for photos. In 2017, 1300 young people stayed in homeless shelters in Columbus and Franklin County. 532 of them were teenagers who found safety and support at the Huckleberry House crisis shelter. Another 76 young adults did not have to go to a homeless shelter because they became part of the Huck House Transitional Living Program. Through this program, they were provided with a safe place to live while gaining education, employment and life skills needed to live independently in permanent housing.